What will it be this New Year? Intentions vs Resolutions - CoreBody Pilates + Yoga Inc. So on this “intentions” idea, I say forget the resolutions. Together we can move beyond resolutions and instead create, cultivate and manifest great intentions. Intentions are easier because they don’t tie us to a specific outcome. Intentions simply ask that we go through our day, hour-by-hour, being mindful, conscious, and present which are all things Pilates and Yoga cultivates. 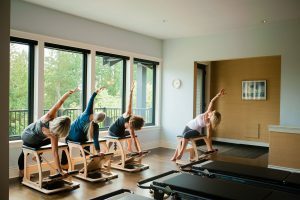 As a relatively new Pilates and Yoga space in Deep Cove, my intention this year is to appropriately challenge my clients so that they may see the progress they came to us for. Everyone knows that feeling of accomplishment when you’ve surprised yourself that you could do something you thought you couldn’t?! As instructors we want you to consider and attain the amazing feeling when you discover that you are getting stronger, and more flexible and able to get to that next level/layer with your practice. I say appropriately challenge …as it’s tempting to keep our clients in a safe zone of easily accomplishable exercises. Ones they feel they “get” and need very little struggle to achieve. However, repeating the same level of exercises won’t help our clients progress. Not really. Progress is achieved by going just beyond normal effort. It’s the struggle that is of value. The appropriate struggle is when a client can almost accomplish the task/action without being in danger of getting hurt and can sense that it will be possible in the near future or they nail it because it was possible! I am not a supporter of offering up exercises that you simply are not strong enough to really dig into and enjoy as you progress. However, I offer the next level of an exercise when I believe you are ready strength and flexibility wise or nearly there. For some though, your mind and interest may not be there….yet or ever…and that is totally fine. You progress as you need to in your own time. So, over time and when clients are ready for the next layer/level of an exercise…I like to help clients progress. This can be creating a flow with easily accomplishable exercises to add endurance training to the mix. It can be adding on a new variation of an exercise and or an entirely new exercise that challenges one’s proprioception, balance, flexibility and strength and or all of the above! Nothing is more satisfying for a client and an instructor to feel and see one’s progress…rolling with more control, attaining a deeper level of pelvic floor/transversus contraction, standing for side splits or moving from the long stretch plank into a pike position of up-stretch with precision… these all happen when a client is mindful, conscious and present! Pilates as a method of movement, focuses on the following principles: concentration, centering, control, breathing, precise alignment and flow. Concentration: Focusing on clearing your mind of all the things you need to do that day and focus on each exercise in a deeper way keeping your mind in the moment of the movement. Centering: Paying attention to your mid-line integration and the muscles closest to the spine for support of your spine with a somatic and organ mode of movement. Control: Working in a slow and controlled manner is key to activating the core stabilizing musculature. Breathing: Every breath you take within your practice is the opportunity to start fresh and re-group. Breath is the foundation and fuel of the ascending contraction of the pelvic floor that in turn fires the transversus abdominis, which is the primary focus prior to stabilization and movement. Precision: Precise alignment and core organization for isolated muscular engagement is essential to seeing benefits from your practise. Flow: Flow is seamlessly moving through the repertoire, each exercise transitioning smoothly from one to the next as you progress. be happy with how you are progressing. …whatever they may be for you this year!